The London Record Fair will run over four days from the 3rd-6th October at The Old Truman Brewery on Brick Lane in the heart of East London. 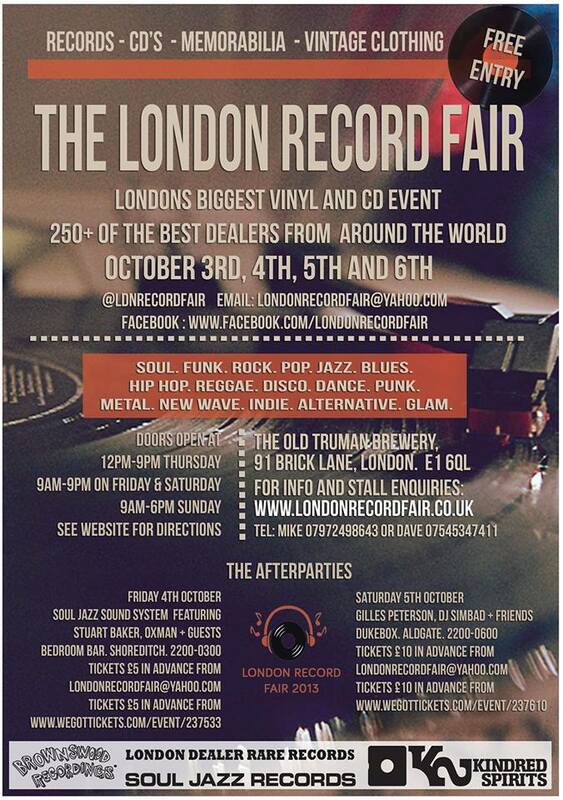 It will bring together the biggest and best record dealers in Europe, who specialize in collectible records. Every musical whim will be catered for: from rock to metal, Jazz to funk, classical to progressive, blues to folk, dance, soul, reggae, hip hop, Latin and psychedelic. Admission is free, so get those sharp elbows and wallets at the ready! After all that crate digging, vinylholics can come and shake a leg and enjoy a few (well earned!) drinks at one of the fair’s two after-parties. Soul Jazz Sound System, featuring Stuart Baker, Oxman & guests will be performing at The Bedroom Bar in Shoreditch, on Friday 4th October (10-3am). Legendary DJ Gilles Peterson is hosting, what’s sure to be an amazing, after-party with dj Simbad at Dukes, Aldgate, on the Saturday 5th October (10-6am). This is one night not to be missed, as anyone who has seen Gilles, will know! Check the London Record Fair on Facebook and Twitter for updates and competitions.